The performance requirements for VR games are much higher than for typical PC games. So if you're thinking about buying an HTC Vive or an Oculus Rift this holiday, wouldn't it be good to know that your PC is ready for VR? 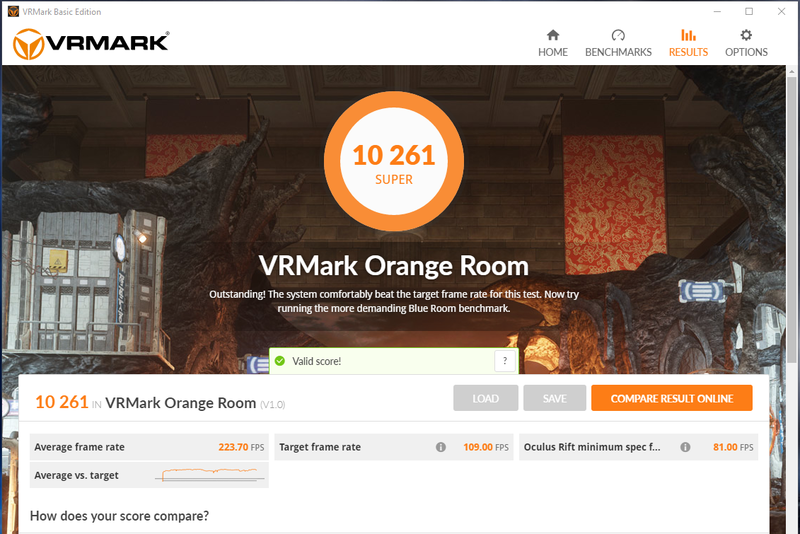 VRMark includes two VR benchmark tests that run on your monitor, no headset required. At the end of each test, you'll see whether your PC is VR-ready, and if not, how far it falls short. 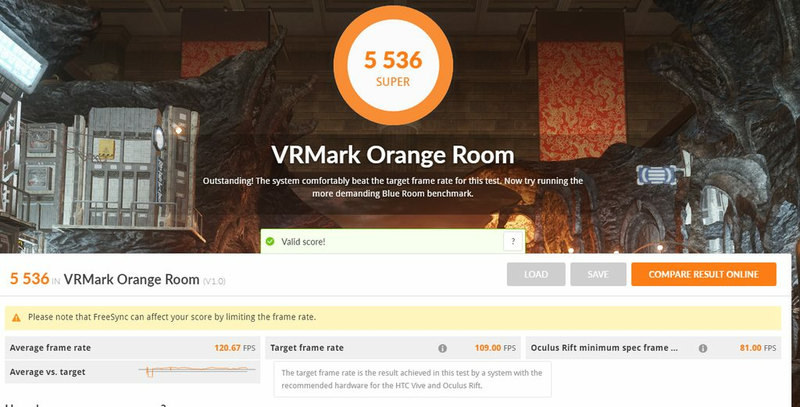 The VRMark Orange Room benchmark shows the impressive level of detail that can be achieved on a PC that meets the recommended hardware requirements for the HTC Vive and Oculus Rift. If your PC passes this test, it's ready for the two most popular VR systems available today. 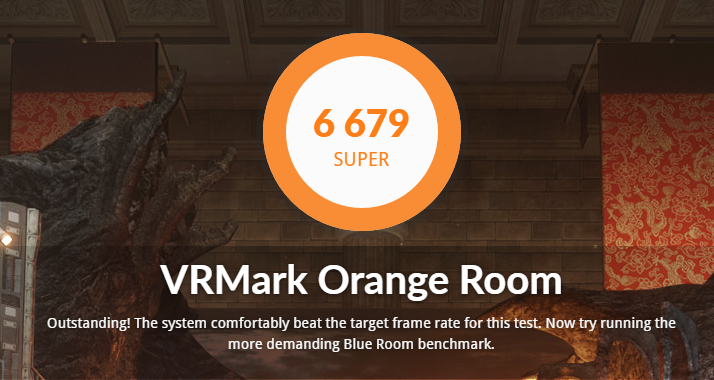 The VRMark Blue Room benchmark is a more demanding test with a greater level of detail. It is the ideal benchmark for comparing high-end systems with specs above the recommended requirements for the HTC Vive and Oculus Rift. A PC that passes this test will be able to run the latest VR games at the highest settings, and may even be VR-ready for the next generation of VR headsets. 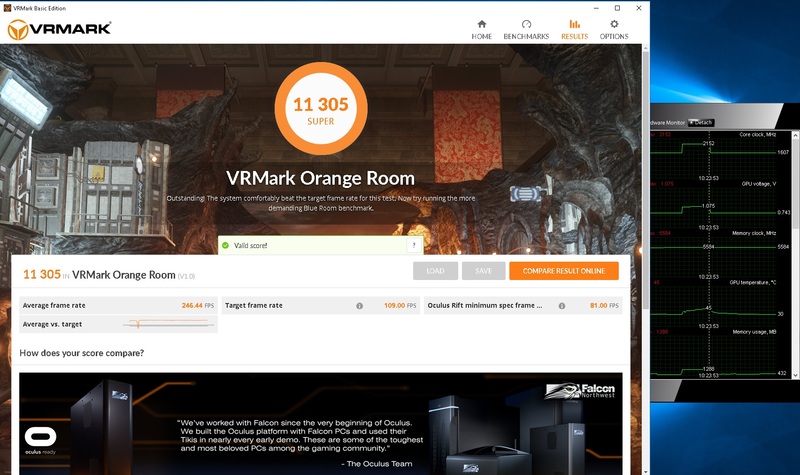 After running a benchmark, you'll see clearly whether your PC is VR-ready or not. To pass, your PC has to meet or exceed the target frame rate without dropping frames. You also get an overall score, which you can use to compare systems. 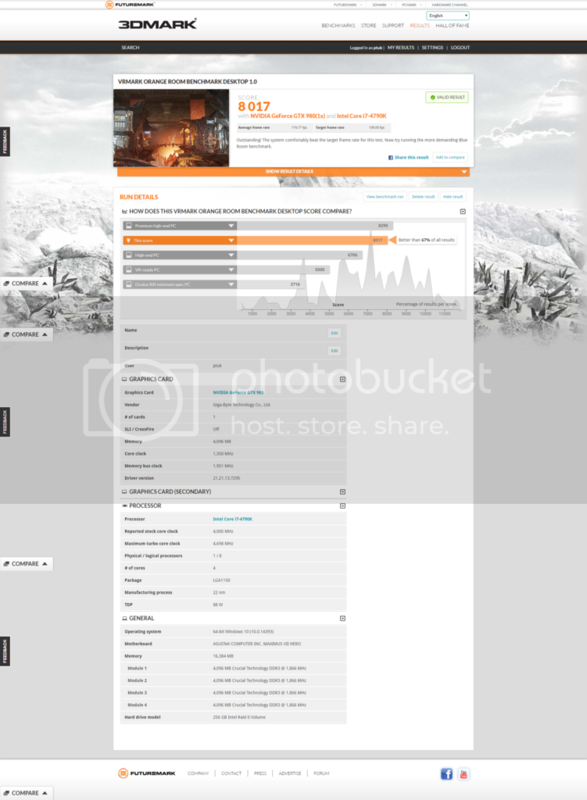 Hardware monitoring charts show how your PC performed frame-by-frame. There are charts for frame rate, GPU frequency, GPU load, and GPU temperature. VR headsets use clever techniques to compensate for missed frames. With Experience mode, you can judge the quality of the VR experience with your own eyes. VRMark Experience mode features free movement, spatial audio, and an interactive flashlight for lighting up the details of the scene. Explore each scene in your own time in VR or on your monitor. Make tests more or less demanding with custom settings. This is a minor update. 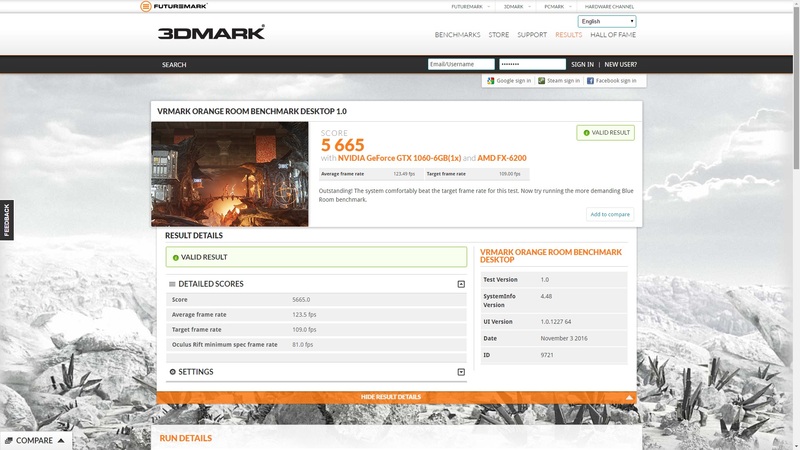 Benchmark scores are not affected. Improved •	Improved presentation of AMD Ryzen specifications on the Results screen. •	Improved update notification system. •	Text, logos, links, and file paths updated to reflect new company branding. For some reason Benchmark is warning me vsync should be disabled becouse it effect the score/framerate (there is no option to disable/enable). Then it means to disable it in the video card options "NVCP". My score on this **** amd pc.. Honestly, really good for a 3 year old GPU. Holy hell, OC made a big jump. that being said I need to try this benchmark out but so far I've had no issues with my 980 in any of the games I've played. You are barely getting 1k higher score than me with a gtx1060. Ah, that sweet bottleneck. Remember folks, this is a combined test, it's testing your cpu as well as your gpu! That explains some of the anomalies in scores. I really want one but the use I'd get from it doesn't justify the price for me. It's basically a display device, so if it was more like £200 (the price I'd pay for a monitor) I'd buy one if it had controllers as well. ok he's using a 290x, but still.. Anyone with i7 + 1070 or 1080gtx? I'm getting around 74-88% usage with this benchmark on W7,can someone test that on W7 for me ? Don't have a screenshot yet since I should be in bed, but I got 9875 on Orange room with my system at my GTAV clocks. GTAV is the most sensitive game to my respective OC's in my signature, so they come down to 4.3GHz on the CPU and ~1375MHz on the GPU. I suspect I could just hit 10k with my CPU@4.5GHz and GPU around ~1440MHz. Have to get my friend to run this since we just built him a PC for a Vive headset and he decided to go with a 6600k+RX480 instead of my recommended 6700k+1060. Hope he gets over 5k! Amd fx 8120 con turbo core activ. 4.3mhz/ temp 49-54°c aprox. Well they test Blue room too (more gpu demanding) and its the same ~ 600pioints difference by 980ti vs 1080 both at stock clocks.